Winner of the PEN/Hemingway Award for Best First Novel among a host of other accolades and appearing on just about every best-of-2018 list that I came across I figured that I should probably read it because Hail to the Thief is my favourite / the best Radiohead album (don’t @ me) and then I read a bit and learned that the title is actually a reference to Gertrude Stein but by then I was already invested in the novel so I kept going. (A character does listen to the Radiohead song along the way as well, so, good taste.) There There starts out as a series of separate but interconnected short stories that come together over the course of the novel and culminate in the planned robbery of a powwow. This book doesn’t need me to heap any more praise onto it. It takes a bit to get going but it’s worth sticking around through the end. I look forward to the author’s next work. 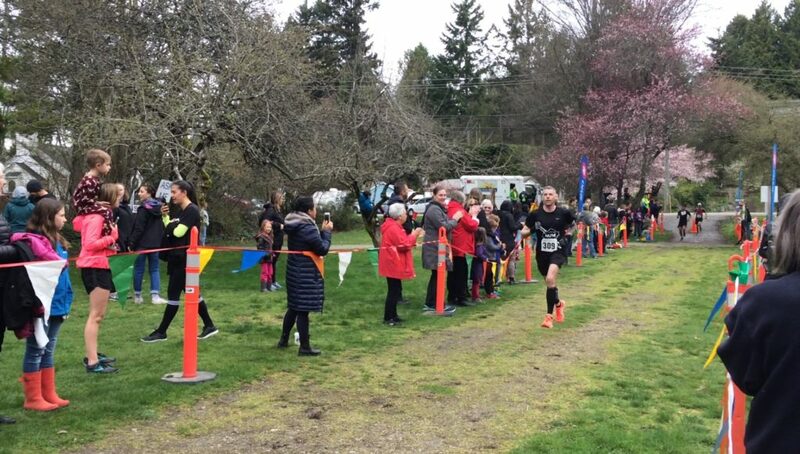 Today was test day four weeks out from the BMO Marathon and the test I chose was the 42nd (fitting…) running of the Sunshine Coast April Fool’s Day half marathon from Gibsons to Davis Bay just south of Sechelt. I’d not run this race before, but saw a few people I follow on Strava post their results last year and I thought I’d give it a go. The course is a net downhill but they really make you work for it. This is the hilliest course I’ve run and a couple of the downhill sections were just as hard as some of the uphills. The race started at 9:17 a.m. with a bit of a hill off the bat then into a long downhill. I got off to a great start and got into a rhythm that felt really comfortable, rolling with the hills up and down, consciously trying to keep my heart rate steady. I hit halfway at 45:39 and was one second ahead of my goal pace of 4:20/km. The field had thinned out too; after some back-and-forth passing with a couple guys throughout the first half I checked my shoulder on a meandering corner at around 13.5 KM and there was no one in sight. The real challenge started at about 14 KM with the last big long hill that kept rolling up until about 17.5 KM, then it was all downhill to the finish. I got passed by an EVRC guy a bit before the peak, then almost caught him but couldn’t quite hang onto his pace. I finished 1:33:30 for a 4:25/km pace. It wasn’t the finish that I wanted, but I had a pretty strong finish, ending up with my third fastest half marathon time, on undoubtedly the toughest course I’ve run. I ended up 33rd overall for top 9% of the field, and 8th in my age group. It’s hard to not feel a wee bit disappointed with my result, but it’s a pretty great result for me, and as far as tests go I feel pretty good about where I’m at going into the marathon in May.